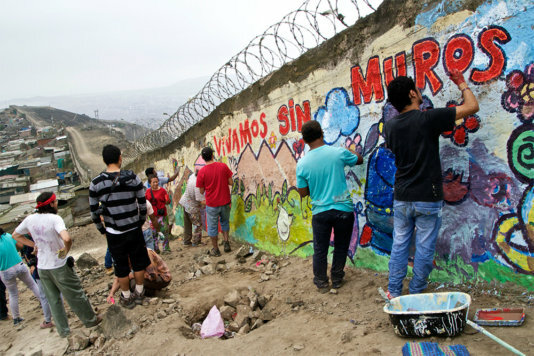 When young people put aside their Saturday leisure activities and, summoned by a social network call, gather at the front of a university in Lima, they have a plan: They will undertake a trip through the suburbs to Pamplona Alta, to the hills surrounding the Peruvian capital and paint a wall that divides a small city. “We do this because we think this wall shouldn’t be here”, says Pedro Elías, a young psychologist while the rest paint a scene with three children playing, pets, some trees and grass -that differs from the desert landscape surrounding them- and “a motto in Spanish: “Vivamos sin muros” (Let’s live without walls). The concrete barrier, crowned with a barbed wire and extended over 12.5 kilometres in two sections, is not located in a conflict frontier between two countries. Its function is to separate one of the many poor squatter slums scattered across the hills that demarcate the west of Lima from the most exclusive residential developments in the city, Las Casuarinas. The rampart building began three decades ago to avoid the growing of the slum towards Las Casuarinas and the passage of their inhabitants to the rich neighbourhood. 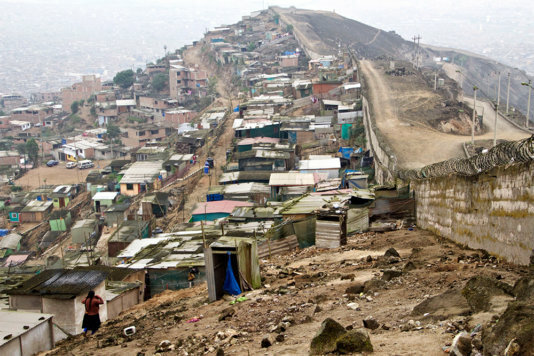 It has been enlarged since as the shanty town grew up and has become a symbol of the inequity prevailing in Lima, in Peru and in all Latin American. So, it’s been named ‘the Wall of Shame’. On one side of it, at the bottom of the hill, big mansions hide behind more walls in the immaculate streets. High-class families live in spaces of 1,200 square meters with gardens and private swimming pools, as Diana Rivas, an anthropologist who is doing her thesis about this wall, points out. On the other side, she compares, the families live in 3x5 meters shacks made of wooden planks and tin roofs, with bare earth floors and not essential services. “Our toilets are in cesspools outsides the houses so our children usually get sick. We lack water service. It comes to us in tank trucks and because of that, it’s more expensive for us than for the neighbours of Las Casuarinas. I spend 80 soles (about 25 dollars) a month in water”, Berta Sulca, one the Pamplona Alta inhabitants, complains. “Besides, as we don’t have electricity, we often use candles and that have caused some fires”. “We don’t want this wall. People are not different from each other by being rich or poor. We are hard workers. Every day we wake up at four in the morning to get by. Sure the rich people get up later”, she adds. They usually have a long journey by ramshackle buses to get their jobs. They have to add some extra minutes because the wall forces them to a detour to get the nearest bypass. On the other section of the wall is even worst, as many of the shanty town inhabitants work on the other side in security and domestic labors, gardeners, recycling garbage... There is a guarded gate open from the morning to the sunset, but if they forget their IP or they cannot come back in time, they must surround several hills in a three hours trip. In addition to this, in Pamplona Alta there are no parks or recreational spaces for the children. So, Pedro Elías and other friends, as well as psychologists, created a year ago an alternative educational association, Ayni Perú, to support them with an active pedagogy and have just built a school in one of Pamplona Alta quarters, a little room where children have a space to learn and make some activities. To celebrate it, Ayni have summoned groups of activist painters and volunteers to paint the rampart and give some joy to the sad view of the plain wall. “This wall represents a group of people who are completely disconnected from what’s happening in Peru. That’s why they build fences, as what need is education and other things”, regrets Elías. The volunteers ask the children to choose the theme for the painting. They decide to draw children, houses in hills, trees and especially some animals. Then, altogether mix the colors and do their bits to the painting. “The children have told us how they feel the place where they live and how they want to improve it”, Elio Martucelli explains. He is a member of Brigada Muralista (Mural Painting Squad), a collective of artists who decorates walls all around Lima in collaboration with the quarters civil organizations. “This is a conflict area and this kind of activities try to strengthen the existing ties in this quarter”, he says. As well as “improve this sad view, that it’s a quite aggressive element in the landscape”. Martucelli remarks that “regretfully the years of violence have left a number of walls and fences in the city”, in reference to the intern conflict in Peru, that left thousands of deads in the eighties and nineties. 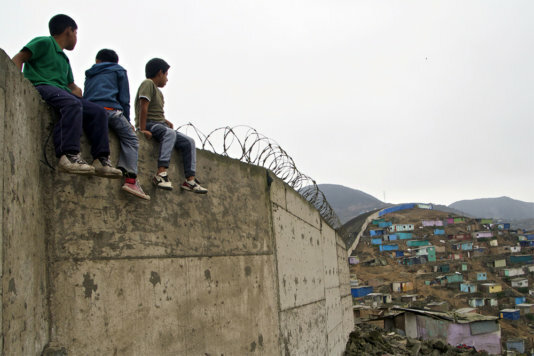 That’s when the first portions of the wall were built, as thousands of displaced persons get to Lima from the rural areas, particularly affected by the violence, and the shanty towns grew up dramatically. “We constantly mix up exclusivity and exclusión, and this is one of the biggest and most embarrassing walls that can exist”, he adds. “Walls have become part of the landscape of this city”. As a matter of fact, the closing of streets or blocks with fences and even security guards blocking the passage has become a common practice in Lima among some neighbours, especially in the last years, as crime rates have increased sharply. And not only in the high-class areas. That’s forbidden by law, but district authorities allow and sometimes promote it. “There’s division, there is racism. It’s obvious. You live it every day”, Elías accepts. “But I think there is solidarity in the Peruvian society. Here we have over 30 people who came selflessly. They do it because they want to do it and because the think this wall shouldn’t be here”. “Someone builds walls and we paint them. If they build more of them, we’ll paint them too. We don’t only want to complain, we want to move on to creativity”, he concludes.